Risk Budgeting Basics: Can U.S. Treasuries be Riskier Than Emerging Market Stocks? Risk can be defined in multiple ways: beta to the stock market, standard deviation of returns, relative standard deviation to the stock market, probability of catastrophic loss, probability of not realizing goals, or probability of not sticking with investments, among others. None are correct or incorrect. The definition depends on the investor’s experience and whether he or she has a good financial advisor to guide them through each risky scenario. The most important definition of risk, in my opinion, is the risk of not realizing financial goals. This risk is most often incurred when investors get in their own way, in other words they make mistakes by chasing performance, trying to time the market, not properly diversifying, etc. Most of the time, a highly volatile investment will cause investors to second guess it when it underperforms. And when it does, they may get scared out and sell at the wrong time. This brings me to the title topic: can U.S. Treasuries be riskier than emerging market stocks? It may sound unlikely, but it’s not. U.S. Treasuries are, by definition, very low-risk. Bonds backed by the government should never go bust — in theory. Emerging market stocks, on the other hand, have some of the highest volatility of the major asset classes. How could they possibly be less risky? It depends, again, on the definition of risk. For this example, we’ll review a few measures: one- and 10-year beta, one-year relative risk, 10-year maximum drawdown, seven-year absolute standard deviation, and the CLS Risk Budget. It depends on the target exposure. We will use MSCI’s definition of emerging markets and zero-coupon U.S. Treasury bonds that mature in 25 years or more. The chart below illustrates the ups and downs of the two markets over an eight-year span. It appears ZROZ (Treasuries, gold line) moves around just as much, if not more, than EEM (emerging markets, teal line). In fact, the seven-year standard deviation for ZROZ is 21.19, and for EEM it is 17.26. The orange circle shows that at most times the two lines move in opposite directions. This tends to mean they are inversely correlated. The seven-year correlation between the two is -0.37. We’ll put aside performance for now as this post is about managing risk. The chart above shows the current makeup of CLS’s Risk Budget score. How do the two markets compare on a one-year relative standard deviation? How do they compare on a 10-year relative maximum drawdown? 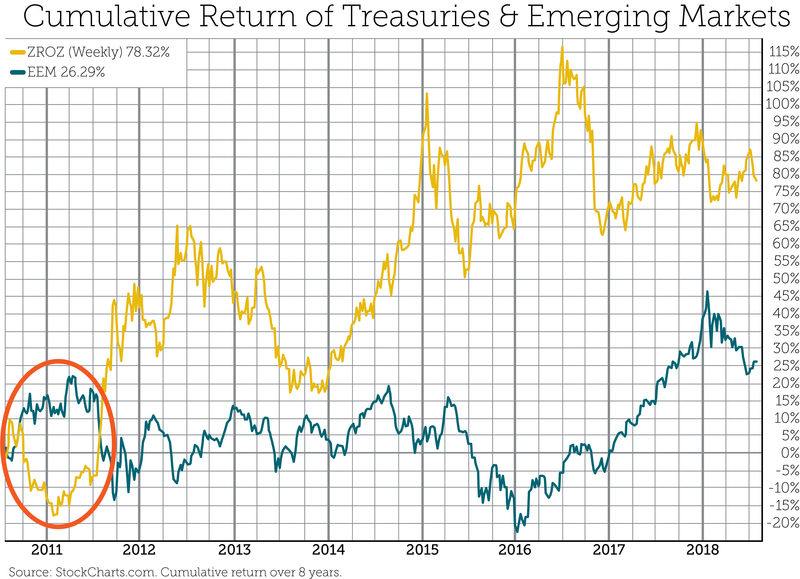 By these two measures, EEM and ZROZ are pretty similar, proving Treasuries can be just as risky, if not more so, than emerging market stocks. For those keeping score at home, we forgot one big measure of risk: beta. Beta comprises two-thirds of the CLS Risk Budget score and cannot be forgotten. What is the beta of the two relative to the global stock market? When building a well-diversified portfolio, beta and correlations are important to consider. The above table and first chart show that one zigs when the other zags and that ZROZ has a low and negative beta to global stocks, which we could expect with the safety of Treasuries. Meanwhile, the Risk Budget scores are drastically different. By itself, standard deviation is not enough to measure risk, and neither is beta. However, calculating them together, along with drawdown, provides a better picture of the risk we should expect when using these two asset classes in portfolios.